Keeping stuff dry and protected in canyons has always been a challenge. Dry bags do okay when they are new, but often puncture or simply wear out. One solution the Euros found long ago is these sturdy plastic kegs, made in Holland, that offer both protection from water and from crushing. Available in America from Imlay Canyon Gear. 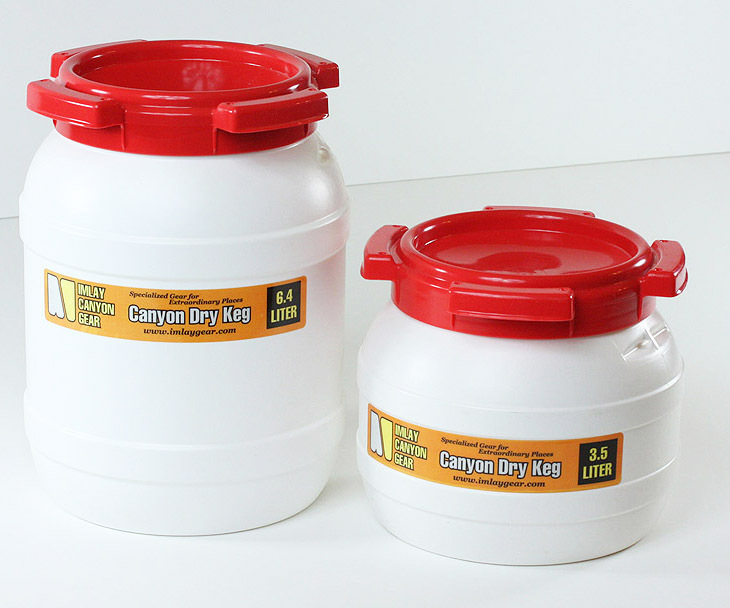 We offer Curtec Kegs in two sizes: Small = 3.5 liters; Large = 6.4 liters. They use the same hard-plastic, rubber-sealed lid, and are sized well for fitting inside packs, while providing maximum protection for your valuables. I think you will find clothes and soft stuff work better in a dry bag, but the Kegs offer both more protection and easier access to things like sandwiches and cameras. Will your camera fit in one of these? Well of course, it depends on the camera. The dimensions are right at that break point where small compact digital SLRs (like the Canon Rebel) will fit in with a 'reasonable' lens. Larger bodies are more difficult, especially with a tripod plate in place, or a largerish lens. Compact cameras will almost all fit... assuming they are smaller than a Rebel. • The top seal can fail. 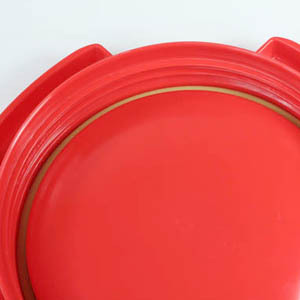 If you try to cram too much stuff inside, it can interfere with closing the lid all the way - pushing against the stuff inside can feel like the last half-turn that seals the top. OR a cord or string can get caught in the top. OR sand or dirt on the seal can prevent forming an effective seal. Keep your keg clean, and don't overstuff. • The stuff inside the keg can rattle around and be damaged. Protect stuff inside the Keg with your spare hat, or a small towel which you can also use to dry and clean your hands. • DON’T throw your pack down onto rocks. If the lid scores a direct impact onto a rock from ten feet, it will probably crack. • If you wrap some duct tape around your keg, then you'll have some handy if you need it. • Since all kegs look the same, use a felt marker to write your name on the outside. • Imlay Packs are sized to fit kegs perfectly. Some people use a dry bag for their clothing, and a keg for their food, emergency kit, camera, radios, etc. • Kegs are fairly well rounded, but do have sharp edges. Don’t use them in tight, narrow canyons where the edges pressing against the fabric will induce rapid pack destruction. • The lid can be leashed to the keg with a piece of small cord, but most people find this more trouble than it is worth.